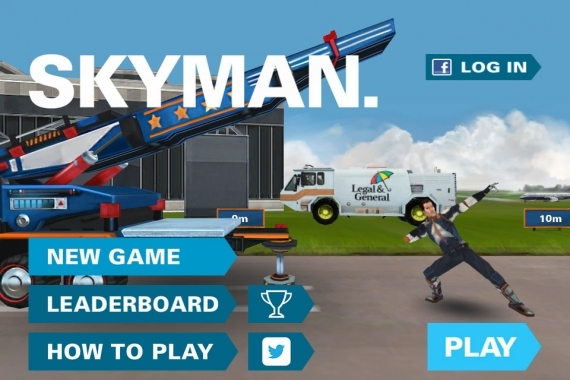 Two months ago we released Skyman on iTunes, Google Play and a 2D flash promo version. Here’s an update on how it did. To give some background, we created a free to play game for Legal & General to help promote life cover and awareness of insurance to a younger audience, one that increasingly leaves decisions on life cover very late in their lives. One could argue that insurance products don’t naturally lend themselves to game mechanics, but we’re big believers in being able to use games to entertain and educate as long as the ‘learning’ is integral to success in the game and the client was especially supportive of our thinking. If a brand message or educational takeout only exists as a series of popups the audience quickly sees through it and can be turned off. Give them something genuinely entertaining and they’re more likely to replay it, share it or take out some learning or brand awareness. Legal & General’s brand is built on realism and many gamers want escapism. We created the Skyman concept to offer both. You take on the role of a stunt man who has to perform at an air show for 20 days. You have to make as much money as possible before your virtual career ends. As you earn money you can upgrade your kit but also invest in ‘insurance products’ such as better armour, stunt doubles, and life cover. Investing more in kit helps you fly further but increases risk to you, whereas investing too much too early in protection gives you less to spend on flying further. We released Skyman on March 10th on iTunes and Google Play and watched the chart position intently. We also placed the flash promo game on gamenet.com. Bearing in mind we had no promotion or features from either iTunes or Google and no paid advertising in place we were relying on organic growth of downloads and were expecting an initial spike and tail, Ideally making it into the top 25 and picking up a feature from Apple. To everyone’s surprise (even our own) we watched the game climb quickly and steadily through both charts by itself, peaking within a week on iTunes as the No.1 overall iPad app in the UK. It’s download growth and fall on Google Play was over a much longer period, peaking at about a month after release but following a very similar cycle. To date it’s had over 210,000 downloads on iTunes and 260,000 downloads on Google Play. In making it to No.1, we were also able to get a great insight into how downloads-per-day correlate to chart position. It takes a steep mountain peak on downloads to give you a smooth hill shape on chart position. This really confirms the observations of others before us that the downloads per day are almost exponential as you get into the top 10 and up to position 1. Attached are a couple of graphs showing the difference in chart shapes.